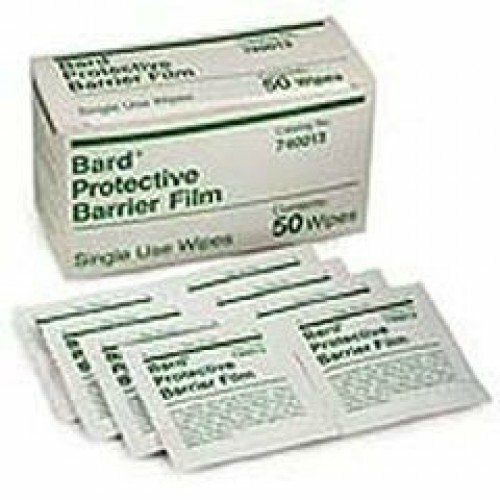 Bard Protective Barrier Film Wipes (Bard 740013) effectively provides a dry shield for open or broken skin in a single convenient disposable wipe. Ideal for skin protection around Ostomy pouches, wounds, external catheters, or feeding tubes. These protecting wipes are also great for preventing irritation and friction against the skin. 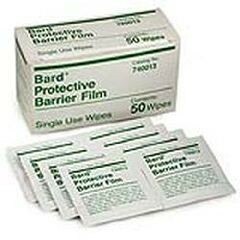 Bard Barrier Wipes come in a box of 50 or case of 600 individually wrapped wipes for quick and easy application. To use, gently cleanse and dry desired skin thoroughly. Simply rub the Protective Barrier Film Wipe on the skin working outward away from the open or affected skin. Re-wipe area each time an appliance or dressing is changed. If skin is raw, there may be a slight stinging sensation but should ease quickly. To remove residual product, use rubbing alcohol or Adhesive and Barrier Film Remover Wipes. Use under any bandage/adhesive and removal is painless as long as you use alcohol.